Hwacheon Sancheoneo, the world famous ice fishing festival, opened in the remote mountain town of Hwacheon in Gangwon Province in South Korea this weekend. This unique festival takes place over 23 days on a frozen river in the town, about 120km northeast of Seoul, and adjacent to Korea. It is expected that more than 1 million people will flock here to drop fishing line through holes in the ice and catch “sancheoneo” – a species of salmon that only lives in fresh water very clean. Activities of the festival take place both day and night. Nearly 20,000 fishing holes were created on a frozen river section about the size of 24 football fields. 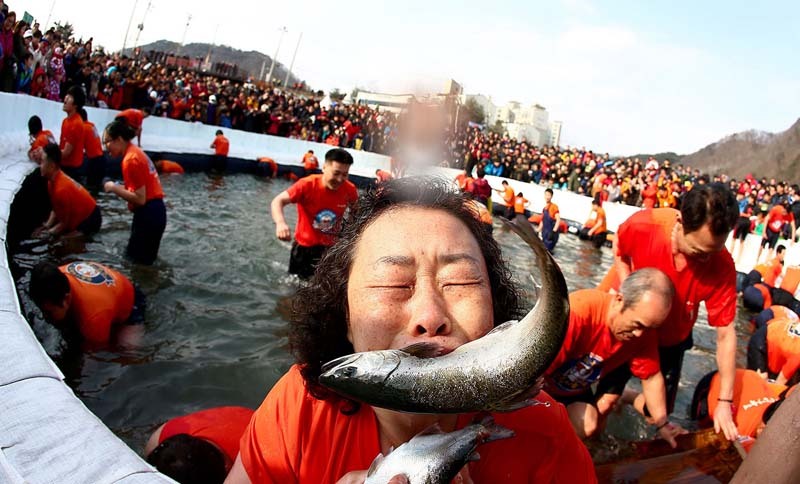 Apart from fishing, another unique point in the festival is that visitors can wear T-shirts and shorts to jump into the icy water to catch fish with their bare hands. The festival also attracts greater attention of foreigners. More than 110,000 foreigners attended the festival last year and the organizers said there were many activities to attract more foreign tourists this year. At night during the festival, a 5 km road in the center of the town will be decorated with 27,000 sancheoneo-shaped fish lamps. This number of 27,000 is equivalent to the total population currently living in the town. Koi carp is a carp symbol in Japanese culture that has been told that, in the past, there were thousands of Koi carp swimming in the opposite direction of the Yellow River, they combined to form one. The extraordinary power can push against the squeezing water, but when it comes to the big waterfall of Vu Mon, there are a lot of fish that give up because the waterfall flows with white foam. Some of the rest of the Koi tried to persevere, trying to cross the waterfall and finally to reward the efforts of these fish that the gods turned it into a majestic golden dragon. This entry was posted in General and tagged fishing festival, South Korea, weekend on February 10, 2019 by Adrian Schmidt.